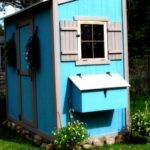 April 16, 2019 | Filed in: Free DIY Chicken Coop Designs. Cut corrugated roofing panels to length at 45". 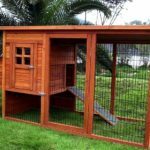 This length provides you with 3" of overhang in front and rear from the coop. 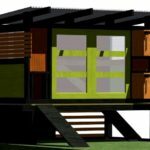 You may make the panels longer for much deeper overhangs, but you need to make certain to possess easy accessibility handle around the front from the roof frame (see step 9). Install the roofing panels with roofing screws with neoprene washers (see page 26 for cutting and installation tips). Cut a plywood back panel to size at 63" × 36". Install the rear so it’s flush using the tops from the coop sides, using 2" screws travelled into the rear and in to the side-wall 2×4s and also the bottom and top rails. Cut a bit of hardware cloth for the best 1 / 2 of the coop’s front, at 31" × 17½". Then, cut 1×2s for securing the mesh: one rot-resistant piece at 31½", one common piece at 31½", and 2 common pieces at 15½". Install the mesh within the right opening in front from the coop, securing it using the 1×2s and a pair ofInch screws make use of the rot-resistant piece at the end (we colored our 1×2s in the finish from the project). Cut plywood for that door at 31½" × 17½". 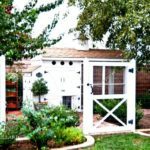 Hang the doorway with two 2½" hinges mounted towards the front bottom rail from the coop and the foot of the doorway. Cut a typical 2×2 to length at 63" for that roosting bar. 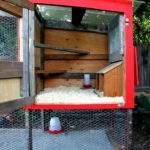 Install the bar with one 2" screw on every side, driven in the outdoors from the coop. The bar also works as a support for that nesting boxes. 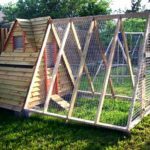 Construct the nesting boxes in the remaining plywood: Cut shelves to size at 36" × 18", then notch the corner to suit round the vertical side-wall 2×4 in the right rear corner from the coop. Squeeze shelf on the top from the roosting bar, and make certain it’s level from tailgate to cab. Scribe across the top edges from the shelf having a pencil to mark the shelf location to the back and side panels from the coop. Take away the shelf, then drill 1/8" pilot holes with the side and back panels 3/8" underneath the scribed lines. Set the shelf back again and fasten it towards the roosting bar with 2" screws. Then drive 1¼" screws with the back and side panels and in to the edges from the shelf.